Break out of self-imposed limitations. Look for wider solutions, 'think outside the box'. Creativity is an act of making something new. It is a mental and social process involving the generation of new ideas or concepts, or new associations of the creative mind between existing ideas or concepts. Creativity is your key to a brighter future. Creativity gives you an incredible source of adventure, achievement, self-discovery, connection, spirituality, awakening, normalcy, self-worth, identity, healing, happiness, energy and power. All progress and innovation is the result of finding new – often radically new – better, cheaper, easier, or different ways to do things and solving customer's problems, and this requires the continual honing of your creative thinking arts and skills. The benefits of functioning more creatively can be enormous. You can win customers and retain them by producing more or of better quality or cheaper or faster or differently – and this requires doing things in new ways, differently, using creativity. 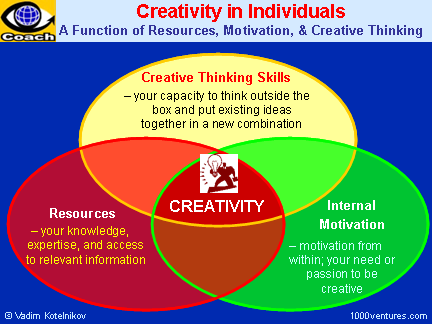 Creativity is not about inventing something totally new, it is about making new – synergistic! – connections. You don't have to be a special kind of person to be creative – everyone can do it. It's not about who you are, it's about what you do. You just need to start looking for multiple solutions rather than settling for just one, and give yourself permission to be playful and inquisitive, flexible and versatile. Although creative people come from varied backgrounds, they all seem to have one thing in common – they love what they are doing. How often should you practice if you wish to win the World Tennis Cup: once a month? once a week? every day? How often should you exercise your right brain's creative muscles if you wish to master your creative skills: once a month? once a week? every day? It was by taking a different view of a traditional business that major innovations were achieved. To find a better creative solution to the current practice, force yourself to reframe the problem, to break down its components and assemble them in a different way. Meditation has been scientifically proven to improve creativity, intelligence, memory, alertness, and to integrate left and right brain functioning. It has been shown to improve physical, mental, and emotional health. In a word, meditation is an invaluable tool to ensure that you are at your very best every day.